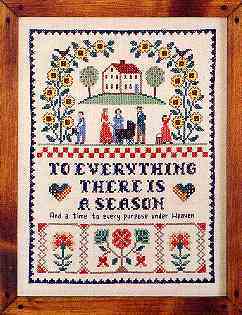 Home > Gardening > 442 To Everything There is a Season 12" x 16"
442 To Everything There is a Season 12" x 16"
This is my first experience stitching a piece where the pattern is stamped on the fabric and I LOVE it! So much easier and enjoyable. A wonderful sampler -- everything about it is high-quality, from the instructions to the marking. I'm enjoying working it and know the finished piece will be just as beautiful as the illustration. Thank you for a wonderful product!